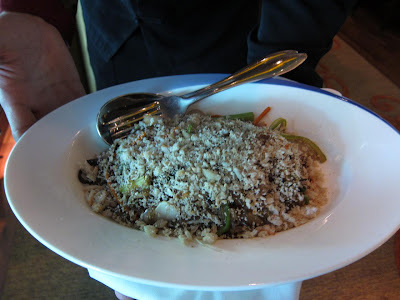 During a quick trip to New Delhi last month, I found myself at the Blue Ginger restaurant within the Taj Palace. As Bangalore foodies will attest, Blue Ginger at the Taj Westend has become something of an institution, especially its Blue Bar. With its success has come the obvious temptation for an encore - in another city. Unlike the open-air al fresco setting of its Bangalore namesake, this restaurant has an opulent, warm and interesting decor. One of the staff, a Vietnamese girl, was in full Vietnamese regalia, her bright turquoise headgear and dress brightening the dark earthy colors of the interiors. Service was attentive and friendly but lacked sophistication and knowledge of the menu items. On this Sunday, the lunch-time patrons has just begun to stroll in; strangely enough all of them women out with their girlfriends. Now this wouldn't be ususual for a weekday, but seemed strange on a Sunday! 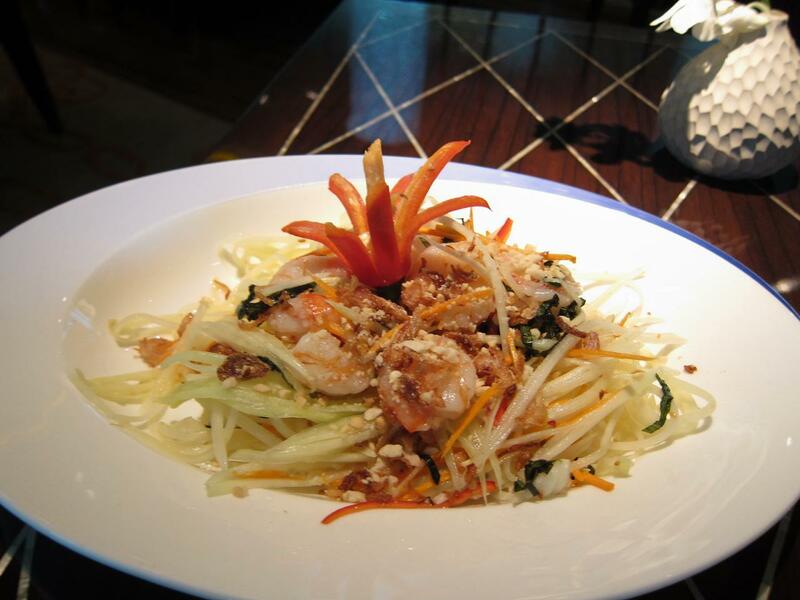 In the hot summer day what better to start with than the Goi Du Du Tom, raw papaya salad with shrimp to cool me down. The salad was good, tangy and spicy in the right amounts whetting my appetite for all that would follow. 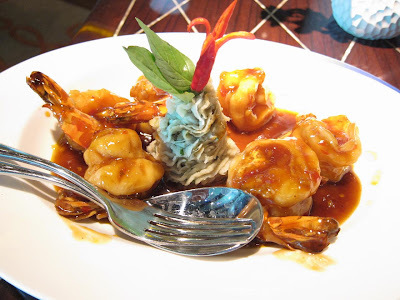 The Tom Rang Me, stir fried prawns in tamarind sauce with sweet potato basil mash was interesting, the prawns large and crunchy, but not a standout. The Mien Xao Cua, stir-fried glass noodles with crab meat and greens was pretty exciting and went well with the sweet-sour-spicy prawns. The dessert was clearly the memorable one: Ice-cream Alaska - a trio of flavors on sticks stuck into a cup-cake. The flavors were an interesting combination too: basil, lemon-grass and pandanus, covered with a layer of thick cream and flambeed before serving. Vir Sanghvi has a review of this restaurant here with several interesting anecdotes. Try this place for something different if you are near the Taj Palace New Delhi. 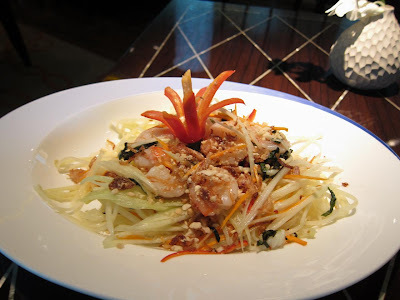 But for a superior experience try The Blue Ginger at the Taj Westend in Bangalore (my review here). 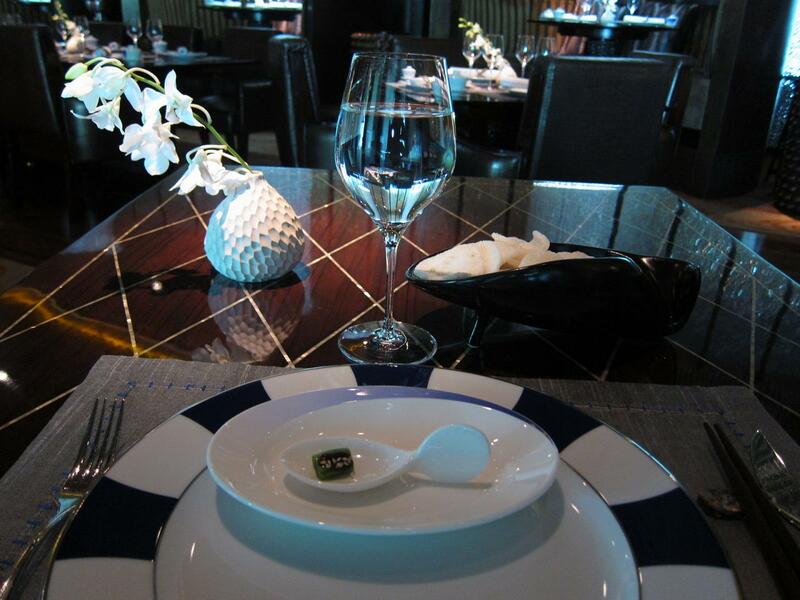 The Taj Palace is no longer the best Taj property in New Delhi; for the foodie that honor ought to go to the Taj Mahal Hotel which now boasts of Varq and Wasabi - both delights for the sophisticated gourmet. I am traveling to Delhi the next weekend.. so should try to figure in a visit here! @Aathira: Did you get to eat anywhere interesting during the Delhi trip? 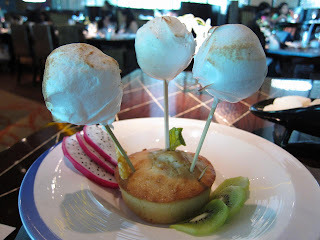 @Sannika: Yes, it certainly made for a great presentation, attracting the attention of fellow diners. Easy on the pocket? Try Mainland China in GK II or Rajouri Garden.